Tim & Tina's new home building blog - redevelopment in Australia! : Day 227: Toilet troubles... and completion inspection? Day 227: Toilet troubles... and completion inspection? Got a call from our SS about lunchtime today - turns out the upgraded toilet we chose (a Caroma something-or-other) at Studio M back in Septebmer 2009 isn't available for months, and rather than using the portable toilet in our front yard, it would be better if we could choose an alternate toilet suite for the house. The other thing is that we now have a date for a completion inspection - Friday August 20th, exactly 2 weeks from today! Since we haven't been inside the house for a while it's hard to know what's been done - in a way, I'd be happy to not go back to the house until the completion inspection. That way, the next time we see it, it should look pretty magnificent and finished! Hope that date is locked in, I've already organised to take that day off work, which is quite a complicated thing to arrange. With any luck, any defects we may detect at that appointment will be minor, and won't be long after that we'll have the keys! We also had a carpet measurer go through the house today, waiting on a quote for a carpet. Here's the thing with carpet - for example, Godfrey Hirst manufactures a range of carpet, but sells them to different retailers under different names, even though they're exactly the same. This prevents you from comparing prices across different retailers - a rather neat way to sidestep anticompetitive price fixing rules. Wonder if anyone from ACCC reads this blog? Anyway, hoping to hear back in the next few days about the carpet quote, we may be able to get it done before handover, if not, then very soon after. 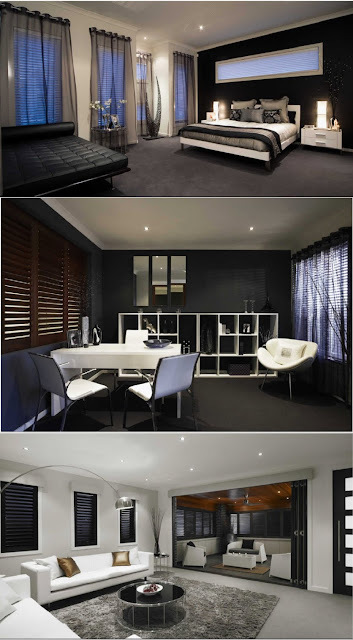 We're wanting a dark grey carpet - found another blog which had exactly the right look in the first two pictures - though teamed with much whiter walls, to avoid the rather "closed-in" feel of too much darkness. MyMetricon has had a very rare update recently - it's about as useful as a chocolate teapot most of the time, and the Certificate of Occupancy is due to be ordered next Friday... the 13th. Hope that's not a bad omen! And non building related, going snowboarding tomorrow - normally we go for a week, but being so close to completion, a day trip will have to do. So if you're planning to go to Mt Buller tomorrow, stay at home instead - I hate queueing for ski lifts! Not long to go until our house is done! Fingers crossed the final product is as perfect as we imagine it should be! Hey nice to see that someone in the area is getting their house finished with Metricon. We demolished at the same time as you and the initial timeline is similar. However, since May 2010 the whole thing has gone pearshaped - 50% of brickwork had to be redone; wrong fascia/gutter; mould in base plates etc etc. We are now 9 weeks from completion date and still not at lock-up. I truly don't see that we will be in before xmas and it is now rather depressing. Until recently I would still have recommended Metricon, however this is not the case today! Maybe we shouldn't have engaged an independent inspector to find all the problems and then we would have a house closer to completion. Enjoy your new home. NB: Our SS is BA. Hi Jen - we know of BA, he was our SS until the slab was done. Don't suppose your house has a balcony overlooking a nice park by any chance? I am so jealous of where you are. We have been fine with everything up until our second inspection and the reality that we are not going to be in before 300 days. If I look at your timeframe, we are at about your 10/5 stage and you are + 3 months. Based on a similar timeframe with us, we won't make it by xmas. The joys! Jen - hope things improve for you. At least you have the comfort of knowing your problems are getting fixed. When we tried to organise a preplaster inspection, the plasterers had already started - we were NOT happy AT ALL!~@W$!~!!! Much better to get all the defects fixed, even if it does mean a slightly longer build time, I think most people would agree! You probably know about the Newhaven being built a couple of streets away from you (street directly opposite the school), I think they had handover last week! Non house related: Movies to watch! A sign for all trades to read! Saving water = higher bills for all!